Description: This is a simple 5mm LED with an interesting array of applications. 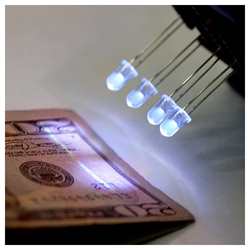 This ultraviolet LED can be used for counterfeit detection (bills, credit cards, documents, etc), sterilization, pesticide, black lights, sun burns, the list goes on. Please wear eye protection when using these LEDs.